ETC: Museum of the Bible - 90 second fly through video (Peter Williams). The museum is, of course, currently under construction. To be honest, the reviewer lost me when he brought in "being" and Heidegger, but maybe that's just me. AWOL: Open Access Journal: Hebrew Annual Review. "A journal of studies of Hebrew language and literature." The Melton Center for Jewish Studies Department of Judaic and Near Eastern Languages and Literatures, The Ohio State University. A new fragment of Ezekiel the Tragedian's "Exagoge"
THE OXYRHYNCHUS PAPYRI: Ancient Egypt: Citizen scientists reveal tales of tragedy unearthed from centuries-old rubbish dump.Papyrus scraps tossed on a rubbish tip thousands of years ago are finally giving up their secrets (Adam Lusher, The Independent). Tales of tragedy written on papyrus that lay hidden for centuries in an Ancient Egyptian rubbish dump have been revealed after being pieced together with the help of a small army of citizen scientists. There's more on the Ancient Lives Project here and links. The Ancient Lives volunteers also helped discover a fragment of a long-lost rendition of the Book of Exodus, written in the style of a Greek tragedy, by a little-known author called Ezekiel, in the Second Century BC, in Alexandria. “Before, we had only known about this work because it had been quoted by the [4th Century AD] Church Father Eusebius,” said Professor Obbink. “We didn’t know for certain that a text existed: Eusebius might have made it up or misremembered it. “Now we have a real copy, a long speech by Moses, in iambic trimeters, telling the history of his life and how he was discovered as a baby in the bulrushes. “We can put some flesh and bones on a lost work of literature, one that was presumably performed long before Charlton Heston. Then the princess with her maidservants came down to bathe. When she saw me, she took me up and recognised that I was a Hebrew. ‘Shall I get a nursemaid for this child from the Hebrews?’ The princess urged her on. Mariam went to fetch our mother who presently appeared and took me in her arms. She then named me Moses, because she had taken me from the watery river-bank. HT AJR. This story broke in August of 2010 and I noted it here with comments and a caveat, all of which, as far as I can tell, still apply. Cross-file under Old Testament Pseudepigrapha Watch and An Army of Papyrologists. YONA SABAR: Hebrew word of the week: Pras/Prize. Mene mene tekel upharsin (Daniel 5:25). Okay, that's Aramaic. Following the analysis of the Hebrew basis-text through the edition of the Genizah fragments (2003) and the synopsis of the manuscripts of both versions of Avot de-Rabbi Natan (2006), Hans-Jürgen Becker presents a translation of Version B with this volume. The translation is in alignment with the text research for this work, which is a central source for historical interpretation and wisdom of antique Rabbinic Judaism, and renders the work accessible to interested neighbouring disciplines. The basis of the translation is the oldest and most completely preserved manuscript MS Parma 2785 (= de Rossi 327, Spain 1289), supplemented by the MS Vatican 303 (Italy, 15 th century). Translation-relevant variations of all textual witnesses are annotated or documented in a synoptic depiction. The greatest possible literality is aimed for and difficult passages are not linguistically concealed. The remarks indicate possible understandings of the text without preempting its interpretation. PHILOLOGIST: CONNECTING GOSHEN TO DEAD LANGUAGES, TRAVEL ABROAD, AND THE OLD TESTAMENT (ELSA LANTZ, The Record). That is, Goshen College in Indiana, not the biblical Land of Goshen. Paul Keim, professor of Bible and Religion, has an office filled with books on languages, books on the bible and one rabbit that he thinks might belong to the Biology department. However, Keim has a stronger focus on classical and dead languages. He’s studied all of the Semitic languages—Hebrew, Greek and Latin [Greek and Latin are not Semitic languages. - JRD]. He has also studied many ancient dialects [i.e., languages - JRD] like Acadian [Akkadian - JRD (the brackets in the next paragraph aren't mine)], Ugaritic, Classical Arabic, Aramaic, Syriac and others. Professor Keim and I overlapped as PhD students at Harvard University in the 1980s. I haven't seen Paul for a long time. It's good to see what he's been up to. Juicing has got to be a new trend, though, right? Nope. 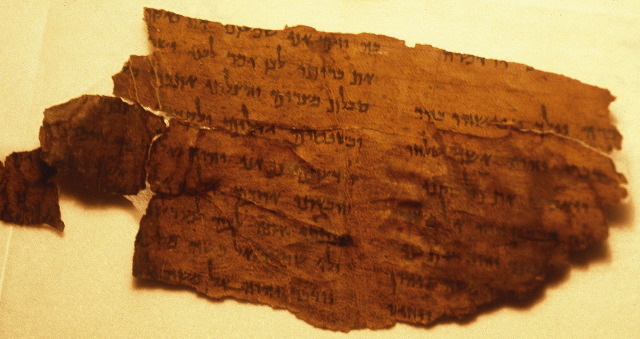 The Dead Sea Scrolls are a collection of nearly 1,000 texts discovered between 1946 and 1956 in the West Bank, thought to date from 300BC to AD100. One of these texts mentions a “pounded mash of pomegranate and fig” resulting in “profound strength and subtle form”. Possibly the world’s first documented example of juicing advocacy? The date range for the scrolls is a little off; let's say from the third century BCE to around 68 CE. More frustrating is the typical failure to cite a specific text. I doubt very much that this quote represents ancient juicing advocacy, but I would be interested to know what it was actually about. Does anyone have the reference? ANCIENT JEW REVIEW: Religious Violence in a Post-9/11 World (Shira Lander). The presentations given in the “Violence and Representations of Violence among Jews and Christians Unit” (henceforth VRV) have deepened our understanding of the intersection of religion and violence in the Greco-Roman world. Many of the papers delivered in this unit have been published, both individually and as books. The unit has collected and analyzed a broad range of ancient examples of religious violence and its representations in both material and literary culture. Earlier essays in the series are noted here and links. ETC: 2016 Summer TWU LXX Summer Course. The abstracts are free, but access to the articles require a paid personal or institutional subscription. MARGINALIA REVIEW OF BOOKS: Here, There, and Everywhere – By Amit Gvaryahu. Amit Gvaryahu on on Richard Kalmin’s Migrating Tales. Richard Kalmin’s Migrating Tales is neither about ISIS nor about Palmyra but about similar pods of knowledge which were successfully able to traverse political and ethnic boundaries. The subtitle, The Talmud’s Narratives and their Historical Context, is slightly misleading. The book is not about the historical context of the narratives but rather about the historical context of their transmission and migration. That is, readers will not get to know the precise location of Alexander’s fountain of youth but they will learn something about the tribulations of the story of Alexander and fountain of youth. In this sense, the stories themselves are historic artifacts. In eight chapters, Kalmin shows how non-rabbinic traditions from the Roman East ended up in the most rabbinic of rabbinic works, the Babylonian Talmud, which was redacted beyond the borders of the Roman Empire. And here I was looking forward to finding out the precise location of the fountain of youth. Earlier posts relating to the book are here, here, and here. EXHIBITION: Gustavus professor helps open museum exhibit “Sacred Journeys” at the Children’s Museum of Indianapolis (Deven Kelley, The Gustavian Weekly). Marcia J. Bunge, Professor of Religion and the Bernhardson Distinguished Chair of Lutheran Studies, was one of eight religious scholars invited to serve as a national advisor for a ground-breaking exhibit on world religions entitled “Sacred Journeys” held at the Children’s Museum of Indianapolis. The exhibit was created in collaboration with the National Geographic Society and funded by a 1 million dollar grant from the Lilly Endowment. The exhibit highlights elements of the history, beliefs and practices of five major world religions. “Sacred Journeys” features videos, photography, and some amazing artificats, such as fragments from the Dead Sea Scrolls, a large stone from the Western Wall in Jerusalem, a throne that had been built for the Dalai Lama, a piece of fabric from the Kaaba in Mecca, and a Hindu statue of Ganesh. The exhibition has been running since late August. Still no word on which specific Dead Sea Scroll fragments are on display. I would think that would be important. Noted just before the opening date here. CINEMA: 'Knight Of Cups' Isn't A True Story, But The Christian Bale Drama Comes From An Unexpected Source (SAGE YOUNG, Bustle). Christian Bale attended Sunday night's Oscars as a Supporting Actor nominee for the financial crisis drama, The Big Short, but the inspiration behind his next project is much more obscure than a recent economic meltdown with global repercussions. Although Knight Of Cups isn't a true story, Bale plays a screenwriter at a personal crossroads. Family drama and loss push Rick farther into the hedonistic playground occupied by industry elite, and he's driven to face some harsh internal truths and the objects of past mistreatment. Director Terrence Malick is infamous for both his unconventional methods and long stretches between film releases, but what drove this particular piece of work? Rick is not based on one existing Hollywood screenwriter, and Knight Of Cups doesn't follow one real-life experience. The film has its roots in a couple of vintage morality tales, including the 1698 allegory, The Pilgrim's Progress From This World To That Which Is to Come; Delivered Under The Similitude Of A Dream. (A catchier title than Knight Of Cups? You be the judge.) Author John Bunyan composed the story of Christian (who is a Christian, because that's how allegory works), who seeks forgiveness for his sins on his journey to the afterlife. According to Yahoo, The Knight Of Cups script takes more than the human need for absolution and mercy from The Pilgrim's Progress; the script includes passages and quotes taken directly from the text. The movie also pulls from another quest narrative, the "Hymn Of The Pearl" from the Gnostic Acts Of Thomas. In those verses, a young boy on a mission is waylaid by seductive forces before he sets himself back on his righteous path. The shared theme is clear: life is full of temptations, and most aren't born with a perfectly calibrated moral compass. Choice reigns supreme. My bold-font emphasis. More on The Acts of Thomas is here. You can read a couple of English translations of "The Hymn of the Pearl" here. Cross-file under Gnosticism Watch. CONFERENCE: Beyond Authority: Composition and Transmission in Late Antiquity. Beyond Authority will focus on the composition and transmission of texts and traditions in Late Antiquity. We intend to dismantle the regnant presumption that late antique tradents compose and transmit texts for the primary purpose of asserting and maintaining authority. Follow the link for registration information and the schedule. According to archaeologist Alex Wiegmann, excavation director on behalf of the Israel Antiquities Authority, "Once again, Jerusalem demonstrates that wherever one turns over a stone ancient artifacts will be found related to the city’s glorious past. The archaeological finds discovered here help paint a living, vibrant and dynamic picture of Jerusalem as it was in ancient times up until the modern era". According to Amit Re’em, the Jerusalem district archaeologist, "This is an excellent example of many years of cooperation and deep and close ties with the Haredi community. The general public is used to hearing of the clashes between the archaeologists and the orthodox community around the issue of the graves, but is unaware of the joint work done on a daily basis and the interest expressed by the ultra-orthodox sector. The Israel Antiquities Authority is working to instill our ancient cultural heritage in this population, as it does with other sectors”. Follow the link for a photo of the site. Articles by JNiMedia and Arutz Sheva have additional photos and the latter also has a video. THE ASOR BLOG: What names teach us about Iron II society in the Land of Israel (Mitka Golub). Names send messages about identity. Today, many African-Americans have first names that are totally different from those of white Americans. But until the early 1970s there was a great similarity between the two communities. Scholars who studied this phenomenon, Roland Fryer and Stephen Levitt, attribute this change to the Black Power movement of the late 1960’s and early 1970’s. When black parents give their children distinctively black names, they declare and affirm their cultural identity. Hebrew personal names from the Iron Age II bear witness to the important historical and ethnic changes of that period in much the same way: the interplay between polytheism and monotheism, the rise of Yahwism, and the evolution of ethnic identities. Hebrew personal names also shed light on the relationship between archaeology and the Bible. Requires free registration to access the whole essay. THE MIDDLE EAST: Paperback non-fiction choice October: Heirs to Forgotten Kingdoms by Gerard Russell (William Dalrymple, The Guardian). Russell takes us on a fascinating and timely journey through the beliefs and predicaments of seven fascinating but little-known religions; as well as the Mandeans and Yezidis, we meet the last of the Iranian Zoroastrians, the Druze and Samaritans lodged uneasily between Israel and the Arabs, the increasingly persecuted Coptic Christians of Egypt and the Kafir Kalash of the Hindu Kush. It’s a long time since I read a travel book that taught or illuminated so much, but its importance is greater than that. Tragically, this book puts on record for the last possible time a once-plural world that is on the verge of disappearing for ever. This summary article on the book is from the Guardian's "Shelf Improvement newsletter" and it links to a full review by Dalrymple at the end of 2014, which I missed at the time. The book is more timely than ever. PaleoJudaica has been keeping some track of most of these groups in recent years. Recent posts on each: the Mandaeans (Mandeans), the Yazidis (Yezidis), the Druze, the Samaritans, and Coptic and the Copts. The past posts on the Zoroastrians have been on the ancient religion (most recently here), but I recently ran across this article on a Zoroastrian community in New York: Zoroastrians Build New Religious, Cultural Center In Pomona, N.Y. (Ela Dutt, News India Times). Zoroastrians, or Zarathushtis as they are traditionally called, are fighting stereotypes about the community’s decline, opening a new religious and cultural center in Pomona, N.Y. this March, and counting a steady rise in their numbers. The new Dar-e-Mehr building is inspired by ancient Persian and Zoroastrian architecture of the fire temples of India. The small community of 500 families of both South Asian and Iranian extraction, raised $5 million over a period of four years from local, national and international sources, to build a home for future generations, a press release from a group of organizations said. The current Zarathushti population in the Greater New York area is estimated at about one thousand and growing as the community becomes more culturally flexible and intermarriage is accepted. TECHNOLOGY WATCH: UCSD Professor Works to Preserve Data from Middle East (Rebecca Chong, UCSD Guardian). Two of UCSD’s professors in the anthropology department are working with the Israel Antiquities Authority to preserve archaeological sites in Israel that are threatened by both violence from extremist groups like ISIS and by development. Their collaborative efforts will update the Digital Archaeological Atlas of the Holy Land, the largest internet repository of archaeological data from Israel. As the director of Qualcomm Institute’s Center for Cyber Archaeology and Sustainability, Professor Thomas Levy will lead the project alongside department research associate Steven Savage. Levy expressed enthusiasm for the unique opportunities that partnering with the IAA will foster. Director of Communications at the Qualcomm Institute Doug Ramsey emphasized the CCAS’s creation as a way of advancing the innovative use of computing in the social sciences. Israel Museum’s longstanding and well-connected director to step aside. In new role US-born James Snyder will continue to foster Jerusalem institution’s global relationships (JAVIER PES, The Art Newspaper ). The Israel Museum will be seeking a new director as James Snyder announced that after 20 years at the helm of the Jerusalem institution he will become its international president. The US-born director, who arrived in Jerusalem in 1997 having worked at the Museum of Modern Art in New York, is due to take up the new role in January 2017. More on the Hadrian exhibition is here and links and more on the celebration of the Israel Museum's fiftieth anniversary is here and links. The annual Coptic Studies Symposium for 2016 focuses on the many areas of confluence and divergence between the fields of Coptic Studies and Egyptology. While the conquest of Alexander the Great delimits the usual parameters of Egyptology and subsequent periods fall within the purview of specialists in Coptic Studies, these different chronological phases are essentially points along a continuum of cultural development that has spanned more than 5000 years. One of the most striking areas of continuity and particularity is linguistic - grammatical, phraseological and lexical. Both Coptic and pre-Coptic, in use over four millennia, have been prominent objects of scholarly attention for centuries; yet the present rift between Coptological and Egyptological linguistics seems to be deepening as years go by, to the fateful loss of both Coptologists and Egyptologists. The 2016 Coptic Studies Symposium will encourage discussion and exchange of ideas between scholars in both fields of study carrying out linguistic research, as well as those whose interests focus on other aspects of cultural production. Follow the link for registration information and the program. THIS WEEK'S DAF YOMI COLUMN BY ADAM KIRSCH IN TABLET: THE FINER POINTS OF TALMUDIC CONTRACT LAW CONTAIN TECHNICALITIES THAT PUT MODERN LEGALESE TO SHAME. Operas set in ancient times are rare, but Russian-Israeli musician Dina Pruzhansky has created “Shulamit,” whose story is based on the Song of Songs. Taking place in ancient Jerusalem during the reign of King Solomon, Pruzhansky’s piece began as a song cycle that was commissioned by the Bacchanalia String Quartet and premiered at Bargemusic in 2013. The first iteration starred Israeli mezzo-soprano Maya Lahyani. THIS WEEKEND: FOURTH ANCIENT JUDAISM REGIONAL SEMINAR (Penn). The location of the event rotates between institutions, and in 2016, it is scheduled to be hosted by Penn. The event spans two days, and it features panels of presentations on dissertation research by ABD PhD students with faculty respondents and ample time for discussion and debate among the attendees, “lightning-round” sessions by pre-ABD PhD students, and meals and receptions oriented toward academic networking. The organizing committee at Penn plans to add a professionalization session in 2016, drawing on the resources of Penn’s Katz Center of Advanced Judaic Studies, which will host the event as well. Ancient Judaism encompasses a large body of textual and material culture, spanning from the 6th century BCE to the 6th century CE and crossing vast empires (Persian, Greek, Roman, Parthian, Sasanian, and early Byzantine). Because of the diversity within Ancient Judaism, its study is necessarily interdisciplinary, incorporating the precision of philology and the theories and methods of history, religion, anthropology, and sociology, among other disciplines. By creating a supportive space for student mentorship and academic networking, Penn and other partnering institutions of the Ancient Judaism Regional Seminar aim to give the next generation of scholars in Jewish Studies the tools necessary to launch their careers and to further research in the field of Ancient Judaism. In the process, we hope to bring specialists in Second Temple Judaism and specialists in Rabbinic and late antique Judaism into further conversation with one another and to enhance the place of Ancient Judaism within Jewish Studies. Follow the link for the schedule. Christopher A. Faraone, Vanishing Acts on Ancient Greek Amulets: From Oral Performance to Visual Design. BICS supplement, 115. London: Institute of Classical Studies, School of Advanced Study, University of London, 2012. Pp. xii, 105. ISBN 9781905670406. £38.00 (pb). The ‘vanishing acts’ of the title refer to the ‘vanishing’ names or words on ancient amulets: these names are written over and over on magical amulets, one letter shorter on each repetition, so that the word ‘disappears’ by the end of the text. These texts were referred to in ancient times as ‘wing-shaped’ (if they made a right-angled triangle) and ‘heart-shaped’ (if they made an isosceles triangle, usually by deleting letters from both the beginning and the end of each line). In the early twentieth century, these were viewed as curative amulets which cured illness by gradually ‘deleting’ a disease or the demon who caused it, a process dubbed deletio morbi. More recent scholarship had moved away from this view of wing- and heart-shaped texts, noting that these ‘vanishing’ texts could be used to summon as well as banish — for example, to call on a demon in a love spell, or to encourage menstrual bleeding to start. In this short monograph Faraone seeks to revive the idea of deletio morbi by showing that it constitutes the earliest stage of an evolving magical tradition, while acknowledging the large degree of variation which exists within this small corpus. Regarding the language of the amulets, Faraone shows that words which appear at first sight to be nonsense (and may, in some cases, have seemed to be nonsense even to the original users of the spell) can in fact be shown to have origins in understandable Greek words or names, often with a plausible connection to the disease which the charm was supposed to cure. In the examples from Aramaic and Coptic, for example, Greek words and names have often been transliterated into other writing systems; the Latin word morbus ‘disease’ also appears backwards on a number of Greek amulets as ΣΟΥΒΡΟΜ (p18). These transliterations quickly seem to become ‘nonsense’ magical words to the users of the spells, showing the important role of language contact in the creation of magical traditions in the Mediterranean. The author’s focus on the interplay between orality and writing throughout the book is thoughtful, and is present in all of his close readings. But he could go even further, since literacy probably also had an effect on the first, oral stage of the five-stage development he lays out. The practice of reciting names which reduce by one letter-sound each time must itself be heavily influenced by alphabetic literacy, since non-literate individuals do not usually segment words into phonemes in this way (Morais et al 1979; Manfrellotti 2001). It seems therefore that even the earliest oral stage of vanishing names may have been dependent on written versions in handbooks, or at least heavily influenced by the alphabetic literacy that was present in Greek society of the first century AD. The Aramaic texts are Jewish Babylonian incantation bowls. Background here. The earlier article suggested the wall may have been built "sometime between the Nabataean period (312 B.C.–A.D. 106) and the Umayyad period (A.D. 661–750)." So the Nabataeans (Nabateans) are still in the running as possible builders, but it may have been built well before their time. It sounds as though we're still in the realm of speculation. Dr. Ben-Yosef and the Timna Valley excavation were also in the news earlier this week. Description What happened to Adam and Eve after their expulsion from paradise? Where the biblical narrative fell silent apocryphal writings took up this intriguing question, notably including the Early Christian Latin text, the Life of Adam and Eve. This account describes the (failed) attempt of the couple to return to paradise by fasting whilst immersed in a river, and explores how they coped with new experiences such as childbirth and death. Brian Murdoch guides the reader through the many variant versions of the Life, demonstrating how it was also adapted into most western and some eastern European languages in the Middle Ages and beyond, constantly developing and changing along the way. The study considers this development of the apocryphal texts whilst presenting a fascinating insight into the flourishing medieval tradition of Adam and Eve. A tradition that the Reformation would largely curtail, stories from the Life were celebrated in European prose, verse and drama in many different languages from Irish to Russian. Cross-file under Old Testament Pseudepigrapha Watch. The same sort of thing was going on with New Testament Apocrypha, as covered in Philip Jenkins's recent book The Many Faces of Christ. ARAMAIC WATCH: UAE rebuilding region's sun temple, brick by brick (Sajila Saseendran, Khaleej Times). The UAE is rebuilding the only sun temple discovered in the region, brick by brick, literally. The remains of the temple used for worshipping the solar deity in the first century were discovered in the midst of the desert in Ed-Dur historical site in Umm Al Quwain in the late 1980s. Ed-Dur is one of the six historical sites the UAE has nominated as Unesco World Heritage Sites. The Aramaic inscription found at the temple mentioned the name of the sun deity Shamash, throwing light on the fact that the deity was worshipped in the region some 2000 years ago. Dr. Zaki Aslan, director of ICCROM-ATHAR Regional Conservation Centre in Sharjah, which is supervising and development and conservation of the temple in collaboration with other governmental agencies told Khaleej Times that efforts have been on to protect the temple from further deterioration and restore it to the state in which it was discovered. The eagles and some other objects from the site have been moved to the museum while the rest of the temple structure is getting reconstructed using traditional methods and materials. "We are trying to reproduce the temple as it was found in the 80s," said Dr Aslan. More on this Aramaic inscription, and on Aramaic at Ed-Dur and in ancient Arabia in general, is here and links. PUNIC WATCH: In a nutshell: the Punic Wars. For nearly 80 years, Rome and Carthage fought for supremacy at sea, on land and from the backs of elephants (Jonny Wilkes, History Extra. And a reminder of why it matters to PaleoJudaica is here. KARAITE WATCH: Fighting the Good Fight in Old Baghdad (Rabbi Richard Baroff, Atlanta Jewish Times). Saadia is remembered as the greatest of the gaonim — those leaders of the Babylonian academies who added so much to the richness of Jewish life and thought. They were all great intellectuals, and Saadia, who flourished in the first half of the 10th century in Muslim Bagdad, was the greatest of them all. Later in the article we get a correct account of Saadia's relationship with the Karaites, which handily offsets the incorrect one in the article noted here. Saadia’s main intellectual and spiritual opponents were the Karaites. The Karaites rejected the rabbinic principle that two Torahs were given to Moses on Mount Sinai: the Written Law and the Oral Law. The Karaites held that only the Written Torah was given at Sinai. This smaller Torah is the sacred text of the Torah scroll. The Oral Torah became the basis for the Talmud and halacha, which the Karaites held was not divine. Saadia became the great champion of rabbinic normalcy and defeated this great threat to Talmudic Judaism. Of the three major arguments for which he is known, two of them bore important fruit. The theologian’s battle against the Karaites prevented a serious schism within the Jewish community, allowing rabbinic Judaism to flourish into modern times. It should be clarified that this reflects the situation in the tenth century and for quite some time thereafter, but not in the present. In the present, the Karaites are still alive and well, and the State of Israel accepts Karaites as legitimate Jews at least to the point of permitting them to make Aliyah (immigrate to Israel). Background on the Karaites is here, here, here, and links. TARGUMAN: Published: Article on 1 Maccabees 2 and Hebrews 11. Chris Brady shares the offprint of his article, "What Shall We Remember, the Deeds or Faith of Our Ancestors? A Comparison of 1 Maccabees 2 and Hebrews 11," just published in the Festschrift for Bruce Chilton, which I have already noted here. HUGOYE: JOURNAL OF SYRIAC STUDIES has published a new issue: Volume 19.1. Follow the link for the TOC and for links to the articles, etc., all online for free. THE OXYRHYNCHUS PAPYRI: Finds in Ancient Egyptian rubbish dumps inspire "world's largest archaeological project" (Ben Miller, Culture24). More on this crowdsourcing project is here and here, along with links to many, many past posts on the Oxyrhynchus papyri. And for more recent posts see here, here, and here and follow those links. LARRY HURTADO: God and the Faithfulness of Paul. See what they did there? Cross-file under New Book.